Charing Cross. By tradition, it is said that Edward I in 1291 set up a stone cross near what is now the courtyard of the main-line station to mark the last resting place of the funeral cortege of his Queen Eleanor as it passed from Harby to Westminster - hence the Cross part of the name which was recorded as the stone cross of Cherryngge during the 14th century. There was a little village here named Cyrringe c.1000 and the name is derived from the Old English cierring, 'turning' or 'to turn', probably referring to the bend in the river Thames nearby. 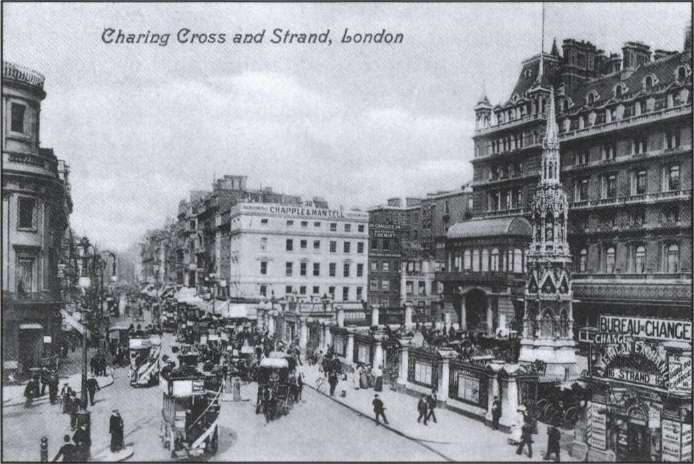 Charing Cross Road was built in the 1880s. Charing Cross early in the twentieth century, looking east down the Strand. The Bakerloo Line station was opened as TRAFALGAR SQUARE on 10 March 1906. 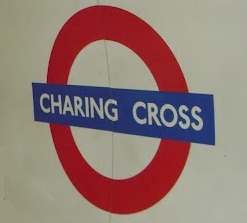 The Northern Line station was opened as CHARING CROSS on 22 June 1907, being re-named CHARING CROSS (STRAND) on 6 April 1914 and further re-named STRAND on 9 May 1915 until being closed for re-building on 4 June 1973. The combined station serving the Bakerloo, Northern and Jubilee lines was named CHARING CROSS from 1 May 1979.